B.A. International Studies with a minor in French. Stefani Waters is a Ringgold High School graduate. She completed her Bachelor's Degrees in International Studies and Studio Art with a minor in French from Georgia Southern University in 2017. She is currently pursuing a Master's Degree from Western Governor's University. She is a lover of world travel. 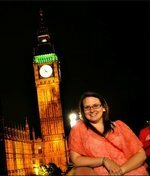 Her favorite trips include England, Germany and Switzerland. HAIL SOUTHERN and GO WARRIORS!